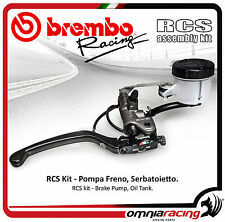 BREMBO 19 RCS Forged Brake Master CYLINDER 110. A263.10 110A26310 18-20. In just a few seconds using a simple screwdriver you can make the braking system more aggressive and reactive (20 mm) or softer and modulable (18 mm). One Brembo brake master cylinder lever parts missing these can still be obtained 19mm in good order. New listingBREMBO BILLET RACING RADIAL MASTER CYLINDER , CNC, TRACK DAY. BREMBO BILLET RACING RADIAL MASTER CYLINDER , CNC, TRACK DAY.. Condition is Used. Dispatched with Royal Mail 1st Class. Front Master Cylinder Rebuild Kit for Twin Disc Harley-Davidson 1996 Up. Front Brake Master Cylinder Rebuild Kit for Single Disc Harley-Davidsons 96-07. FRONT BRAKE MASTER CYLINDER REBUILD KIT FOR 1996 TO PRESENT HARLEY-DAVIDSON. UK Seller, Same Day Dispatch, Satisfaction Guaranteed. Complete with brake lever, makes the ideal upgrade of your standard black master cylinder or good for any Custom application. Material - Forged Aluminium. Brembo PR 19-18 Brake Master Cylinder. 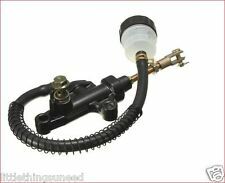 The master cylinder body is milled using CNC technology from cast aluminium alloy. Handlebar fixing Ø (mm) - 22. Lever type - folding. KTM Powerparts Brake and Cover. Fits Most Ktm Models. Premium quality, anodized surface finish. made with love by. Ebblake Industrial Estate. Master Cylinder Repair Kit. Honda Suzuki & Kawasaki. as whole and undisturbed as I can. The photos are of the ones that are for sale. new and unused. Founded in 1993, Frando manufacture a range of specialist braking components, which includes master cylinders. Frando Motorcycle Radial Front Brake Master Cylinder 19mm x 20mm, to suit 22.2mm Handlebars,clip-ons. Brembo 14RCS Brake Master Cylinder is designed for single disc motorbikes. The master cylinder body is forged aluminium then subsequently CNC worked by lightening mill before finally the surface is hard anodised. Founded in 1993, Frando manufacture a range of specialist braking components, which includes master cylinders. Frando Motorcycle Radial Front Brake Master Cylinder folding lever. Will fit 7NB front brake master cylinders. Founded in 1993, Frando manufacture a range of specialist braking components, which includes master cylinders. Frando Motorcycle Radial Front Brake Master Cylinder lever. Will fit 7NB front brake master cylinders. 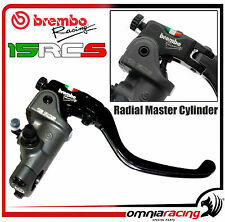 16x18 Ratio Brembo Radial Front Brake Master Cylinder - Forged Body with Standard Lever [folding lever also available]. The Radial Brake Master Cylinder from Brembo combines a forged master cylinder with an ergonomically designed span adjustable lever. Brembo Racing PR 19x18 Forged Brake Master Cylinder Standard Lever - 110476070. Material - Forged Aluminium. The master cylinder body is milled using CNC technology from cast aluminium alloy. Handlebar fixing Ø (mm) - 22. REAR MASTER CYLINDER REBUILD KIT. Master Cylinder Rebuild Kit - REAR. ALL BALLS RACING. Cup Seal, Master Cylinder 1. Contains All of the components required to re-furbish one master cylinder. Kits contain all parts needed to re-seal leaking master cylinders. BREMBO Remote Adjuster for RCS Master Cylinders. One brake reservoir set in black finish with real carbon fibre insert at top. Includes mount bracket and all rubber internal cap diaphragm. Triumph T100 SE (twin disc). Front brake master cylinder for twin disc setup. the master cylinder cap is seized in but does. not affect the use of the master cylinder as. The small screw that holds the clip to retain. 19X18 RATIO. BREMBO RADIAL CNC M/CYLINDER. WITH FLIP UP LEVER. Make us your first choice for all your Motorcycling needs. 650 DRAGSTAR / CLASSIC XVS 950A MIDNIGHT STAR. XVS1100 DRAGSTAR / CLASSIC XVS 1300A MIDNIGHT STAR <10. HIGHWAY HAWK GOTHIC MASTER CYLINDER COVER YAMAHA. Brembo part number -XR0.11.71. Brembo Racing Billet Radial Brake Master Cylinder 19x18. The brake master cylinder is billet machined and allows maximum readiness and perfectly modulable braking in any conditions of use with excellent linearity between the force the rider applies to the lever and the braking response, thereby achieving an extraordinary braking feeling. Master Cylinder Brake Fluid Cap: "GSXR Logo". Material: Billet Aluminum. Color: as on picture. ETZ 125-250-251-301-SAXON and KANUNI. we also rebuild MZ two stroke engines and crankshafts. RECONDITIONED CALIPER. THIS CALIPER IS FITTED WITH NEW RUBBER SEALS. STAINLESS STEEL BRAKE PINS AND NEW FERODO. VN900 VULCAN, VN900 CUSTOM, VN900 VULCAN CLASSIC. Kawasaki Parts. - Radiator Covers. - Battery Covers, Electrics. - Brake Pedal. - Master Cylinder Covers. Custom Accessories. Fits the following Kawasaki motorcycles. ACCOSSATO PRS2 MASTER CYLINDER. THIS SALE IS FOR 1 ACCOSSATO PRS2 MASTER CYLINDER. ACCOSSATO PRS2 BRAKE MASTER CYLINDER, FORGED ALUMINIUM,CNC MACHINED BODY THAT IS HARD ANODISED TO GIVE IMPROVED FEEL AND PERFORMANCE. KTM Reservoir Sock. Simply Slip It Over Your Reservoir To Add That Race Look. Embroidered KTM Logo In Black. Also Prevents Brake Fluid From Leaking Onto Motorcycle Bodywork & UV Rays From Degrading Your Brake Fluid. GPR 125 4T 09-ONWARDS. GPR 50 2T 09-ONWARDS. RS4 125 4T 2011-2013. RS4 50 2T 2011-2013. MULHACEN 125 2007 E3 & CAFE 125 2008. CROSS CITY 125 4T 2007-2012. MULHACEN 125 4T 2007-2009. 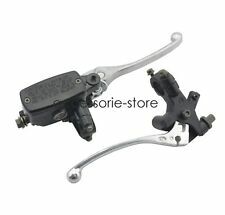 Brembo Folding Lever remote brake / clutch lever adjuster red Brembo RCS 19 Red color. Remote brake/clutch lever adjuster. This Brembo RCS Master Cylinder is a 19mm Piston for dual disc brakes. change the power level of the master quickly and easily. 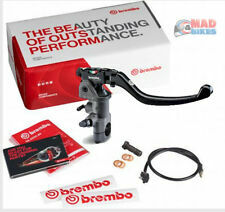 Brembo Racing Billet Radial Brake Master Cylinder 16x16. Brembo part number -XR0.11.30. The brake master cylinder is billet machined and allows maximum readiness and perfectly modulable braking in any conditions of use with excellent linearity between the force the rider applies to the lever and the braking response, thereby achieving an extraordinary braking feeling. GENUINE RST PRODUCT. PLAIN MATTE BLACK HANDLEBAR CLAMP (INCLUDES FOUR SCREWS). CAN ALSO FIT MANY OTHER MAKES / MODELS IF A CLAMP-ON STYLE 1" HANDLEBAR SETUP IS USED. This changes braking power distribution without modifying the pure power of the system itself. The lever consists of two main components: the racing lever guide and the folding, forged lever itself. Simply slip over the reservoir. Made from elasticated cotton. One brake reservoir set with plain black alloy top. Honda CBR1000rr Master Cylinder Cap 50mm Round M/Cyl "CBR1000rr Logo"
HONDA Master Cylinder Brake Fluid Cap: "CBR1000RR Logo". Color: as on picture. Includes mount bracket and all rubber internal cap diaphragm. Height 42mm (not including outlet spout). PART NUMBER: SPTVB001B3. BRUTALE B3 675/800. 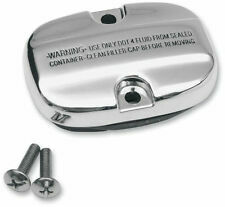 BRAKE MASTER CYLINDER CAP. NEW Black Master Cylinder to fit Harley-Davidson FL FX XL 1972-1981. Suitable for Yamaha XVS950 Midnight Star (V-Star 950) models. Yamaha Parts. - Radiator Covers. - Battery Covers, Electrics. - Brake Pedal. - Face Masks & Hats. Mounts easily with OEM screw. - Fuel Tank Sealants/Protector. One brake reservoir set with plain green alloy top.